Writer, Sarah Butler (www.sarahbutler.org.uk), and photographer, Marysa Dowling (http://www.marysadowling.co.uk/), in collaboration with All Change, are asking the question Who Makes Finsbury Park? 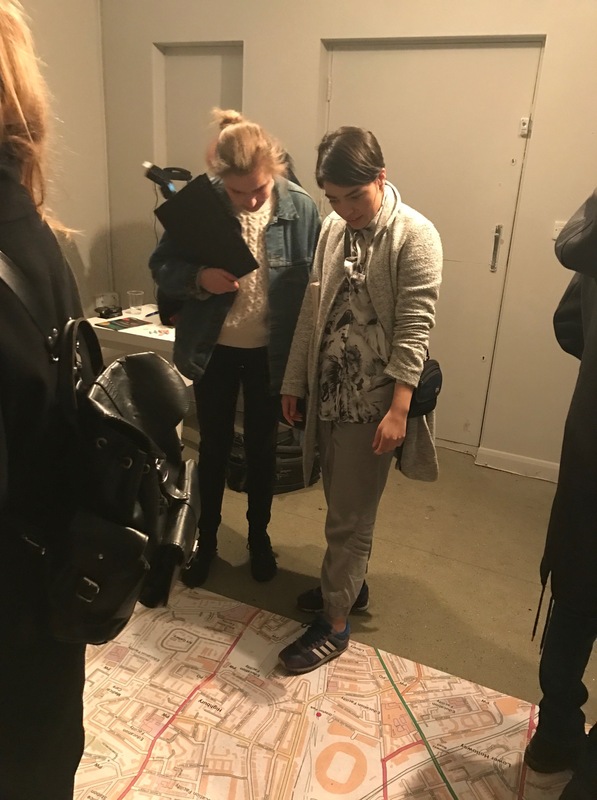 Through a process of portrait-making, conversation and walking, Sarah and Marysa will explore the changing urban fabric of Finsbury Park, uncovering and celebrating creativity, culture and acts of making. Sarah is a published novelist with a parallel practice in socially-engaged, place-specific writing. Fascinated by the relationships between stories, places and communities, her work explores identity, belonging, landscape and home. She has a particular interest in urban spaces and urban change. Marysa’s practice considers human exchange, exploring how people interact with each other and their environments. Her playful and thoughtful projects use photography to build connections across communities and societies. Dowling has worked on commissions and exhibited in the UK, Ireland, USA, Cuba, South Africa, Mexico, India and Lebanon. 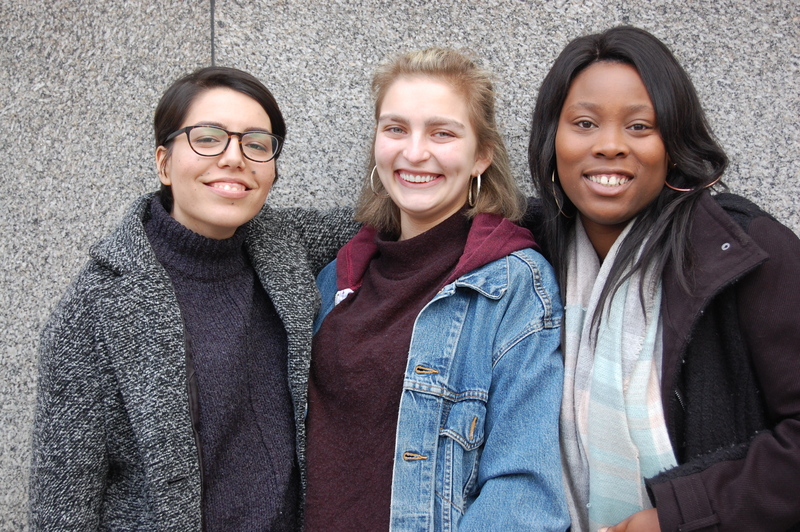 Sarah and Marysa will invite a range of people based or active in Finsbury Park to get involved – leading informal walks, creating portraits, and sharing their ideas, opinions and passion about the area. Both artists will work towards a new body of work capturing and celebrating the culture and energy of Finsbury Park at a time of change. Last week we visited Furtherfield again for their fantastic new exhibition by Alison Ballard. 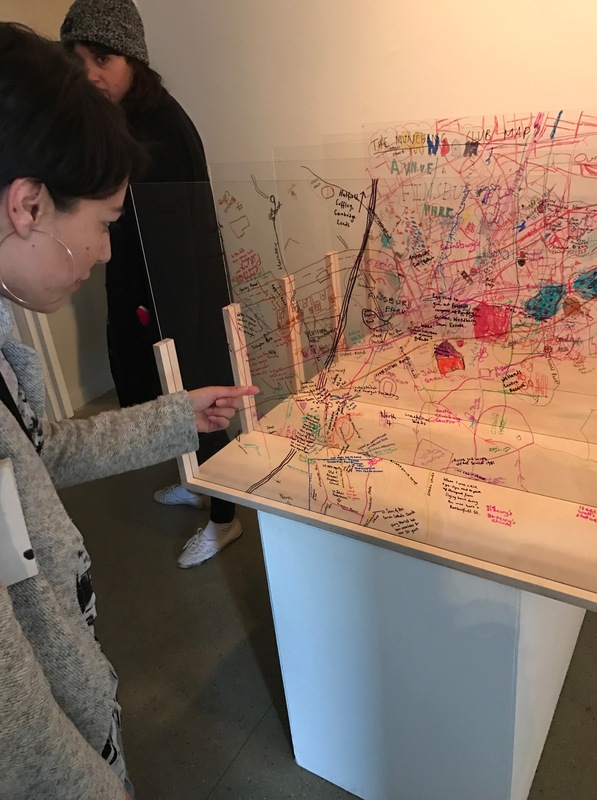 From visiting the exhibition and speaking to Alison, we became interested in how technology, and people, can build narratives around individuals based on superficial information. In this small piece, we play around with contrasting narrative voices – the observing narrator and the internal voice of the character. A woman stepped on to a train at Finsbury Park and planted herself on the nearest seat. Worst sleep ever. Why is rush hour always so bad here? Don’t know how I’m going to get through the meeting. She had a hard-nosed and conceited demeanor. She beadily surveyed the carriage, sweeping each person with a narrowed stare. Can’t believe this. Can’t see a thing. Must have left them on the side. Her [targeted gaze] landed on the woman opposite to her right as she looked her up and down. Like her dress. I saw something similar on Fonthill road last week. She then withdrew her stare and glared onward into the carriage. What’s in the fridge? Would it bad to have PFC tonight? Might be easier…. #Imagine FPK – Do you believe in flying? Do you believe in flying? To fly. To fly high. Do you believe in trying? Would you believe your eyes? What is it to fly? Who told you, you can’t try. 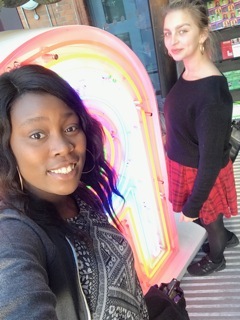 Last week Saturday, we went to Platform Youth Hub to watch Act One’s performance of Do We Ever See Grace? and must we say, what a compelling and moving piece! The play tells the tale of a young girl named Grace who sticks out from the world around her and for this the people condemned her. 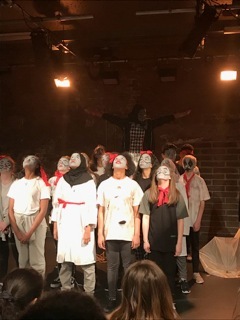 The play is very thought provoking as it illustrates a society where ‘difference’ is a fearful and deviant concept and is portrayed in a darkly clown show thriller. 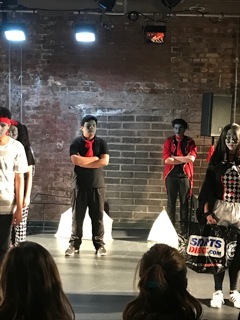 The 13-19 year old actors were exceptional and inspiring! I was so moved by the performance that I was inspired to create a poem called Do you believe in flying? 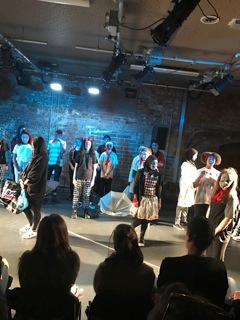 We’d recommend to everyone to watch the play by Noel Greig and to visit Platform Youth Hub that offers weekly activities such as dance, drama and music production all for young people! Not to mention, really yummy Panini’s in the café. Thank you and stay tuned as we’re visiting Offline is the New Luxury an exhibition presented by Allie Ballard at Furtherfield Gallery exploring the relationship between us, technology and hyperreality involving an omniscient narrator. Last week we attended the opening of They Are Here’s ‘Please Identify Yourself’ exhibition. We would highly recommend that you visit – it’s a compelling exhibition, criticising the way that asylum seekers and refugees are stripped of their identity when entering the UK. 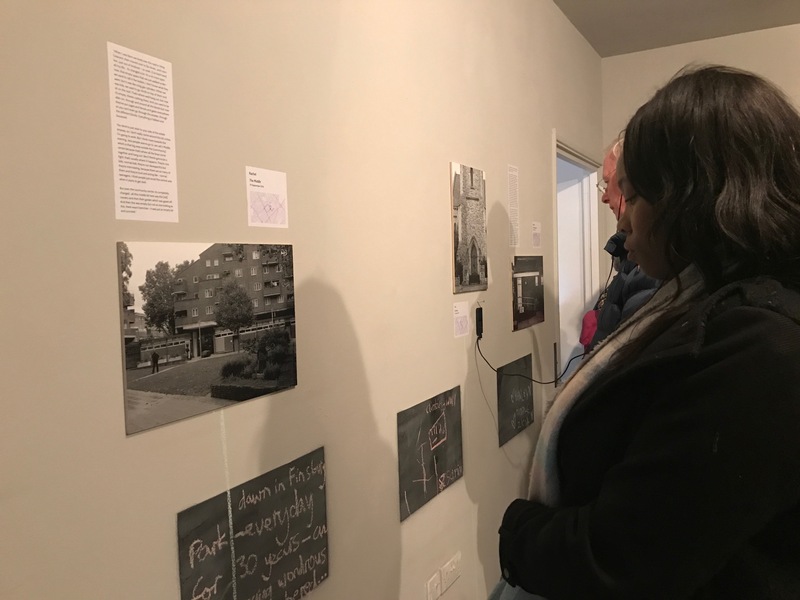 It evoked many questions about our own identities and I have responded creatively to the exhibition with a poem exploring my cultural identity in Finsbury Park. Helping to form my cultural identity. But Finsbury Park includes me. A chance to explore the arts in my own community. P.S We can’t wait to attend “Do we ever see Grace” performance by ActOne at Platform Youth Hub. This performance tells the tale of a young girl who definitely stands out from the world around her – do you dare to be different? A play created by young people in 1985, exploring controversial themes that are still relevant in today’s society. Stay tuned for our response! Do We Ever See Grace? By Noel Graig at Platform Youth Hub on 24th and 25th March 2017 at 3pm and 7pm. Tickets; £1 for youth, £3 for adults. Today we are visiting Please Identify Yourself – an exhibition at Furtherfield gallery. 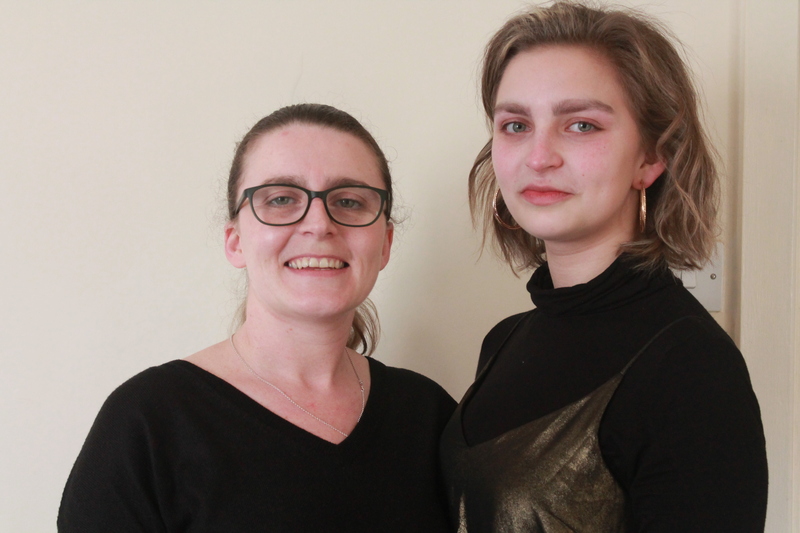 We attended an event a couple of weeks ago, and met They Are Here, a lovely artist duo that are working on a project called Seeds from Elsewhere in Finsbury Park. The project brings together young asylum seekers and refugees, family, friends and other professionals. They are planting flowers, plants and edible produce from their homelands in Finsbury Park and asking what can grow that isn’t from here. We are really excited about the exhibition as we think it is a beautiful project and we are intrigued to learn more about it. We will let you know what we think next week! As you know, yesterday we celebrated International Women’s Day at Park Theatre. SHE was a wonderful exhibition with Chris Avis capturing the bond between mother and daughter in a very pure, natural way. We would definitely recommend heading over to see the exhibition, which is running until April 30th 2017. Didi Hopkins accompanied Chris, and they both gave inspirational speeches about International Women’s Day. The speeches made us think about women that inspire us – particularly everyday women, as we feel they do not get enough recognition for the differences they have made to our lives. We would like to take the opportunity to put our everyday inspirational women to ‘centre stage’ in celebration of International Women’s Month. Morgan’s everyday inspirational woman is her mum, Vicki. Here are some photographs and an interview inspired by SHE at Park Theatre. When I think of my daughter I think of love. I had her when I was seventeen so I’ve grown up with her. My daughter is strength. I’m really proud of her. She’s really grown up and I admire how she can come through hard situations. My daughter will be anything she wants to be. She’s got that drive to push herself along whatever happens, she’s very headstrong. She’ll will always push herself in to a situation she wants to be in – even if she’s in a situation she wasn’t expecting, she’ll make the most of it. If I could affect one aspect of my daughter it would be to show she is capable of doing whatever she wants to. To see herself as I see her. How does your daughter inspire you? By being just the way she is. Her drive. 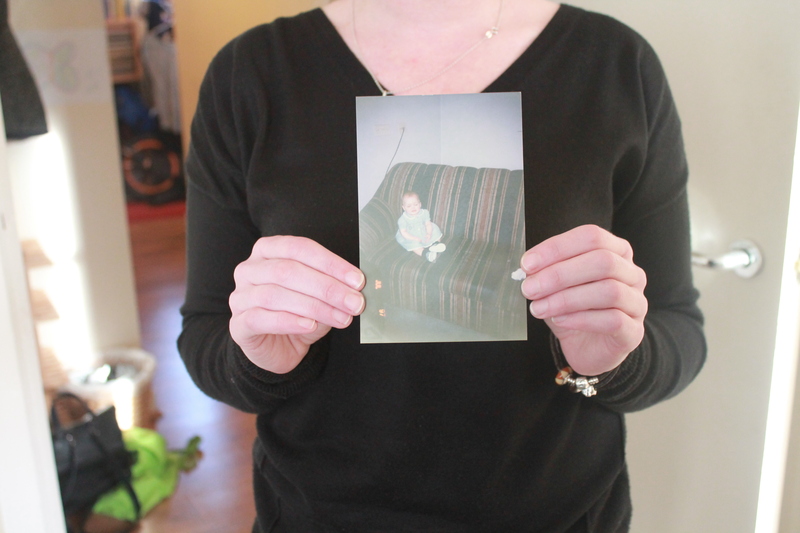 My first memory of my mother… I think I was three years old. We were in Tobago, I’d cut all my knees up, I’d tripped on some glass. I remember my Grandma splashing salt water into the cuts thinking she was hilarious and I remember my mum holding me, holding me away from her and stopping her from doing it. My mother is… a very strong, independent person. She really inspires me to never rely on anyone to do anything for me. My mother will be… happy and stress-free. If I could affect one aspect of my mother… I wish that she could not stress about things so much. Just accept that things happen, and it can be bad but you can move past it and let go of it. She’s shown me that no matter what the circumstances are, everything is going to be alright. 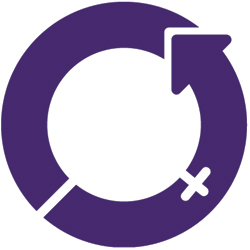 International Women’s Day was originally called International Working Women’s Day, and is celebrated on 8 March every year. A socialist party in New York City held the earliest celebration in 1909, and it was first declared a national holiday in the Soviet Union in 1917. How it is celebrated in today’s society varies country to country, from acknowledging women’s achievements politically, socially and economically to just generally appreciating what women do for us. The exhibition will be open to the public from 9 March – 30 April 2017. Entry is free. Check out our blog post next week to see what we thought of it! 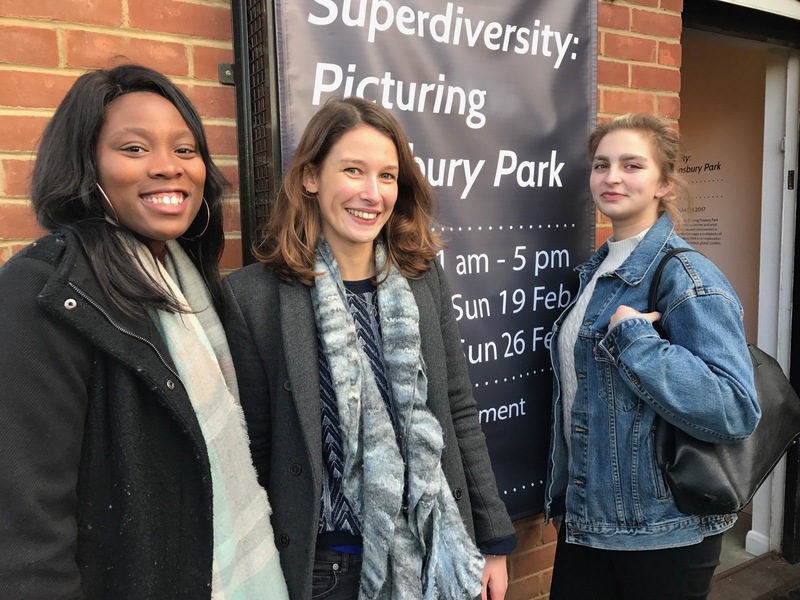 Last Saturday, we went to the Furtherfield Gallery in Finsbury Park to see the Superdiversity: Picturing Finsbury Park exhibition, which mapped out (literally) and brought together voices of the community. But who better to explain what the exhibition is and what it’s about, than artist Katherine Stansfield? 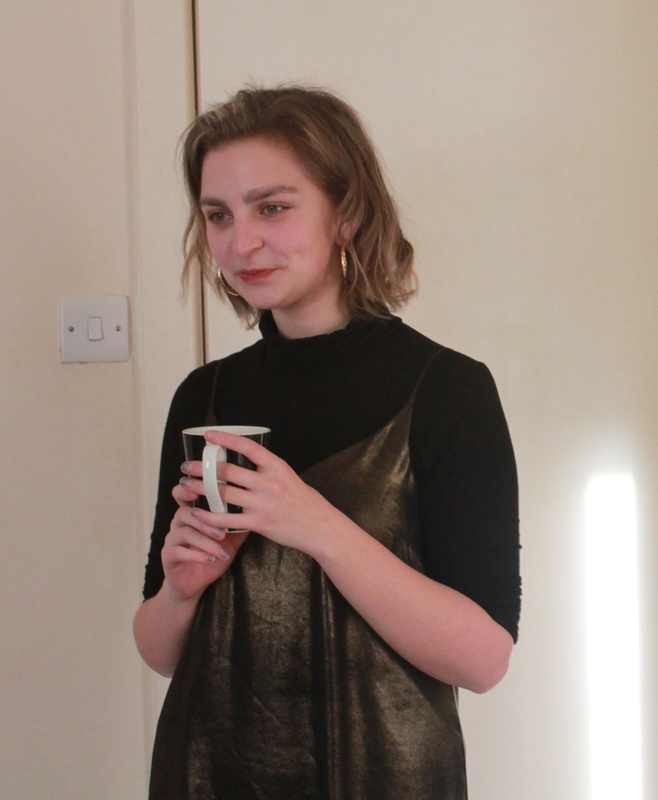 In this interview taken with her at the exhibition opening on Saturday, she speaks about what inspired her to create the exhibition with Furtherfield Gallery and her personal fave spots in Finsbury Park. Katherine: That’s a good question; I think there are many different terms. I’d probably go with a cultural geographer, PhD researcher – I’m doing my research on the whole Finsbury park area – but I came from sociology and I also would call myself a photographer. So it’s kind of all these different labels. I’m doing a three-year PhD project, looking at Finsbury Park as a place, and as it’s a really diverse area, how people, different people, relate to the place and trying to understand that kind of difference and sameness, and how people live together. Lamar: So, what was your inspiration behind this amazing exhibition? Katherine: I suppose the inspiration was doing the PhD on Finsbury Park and I was working with local communities doing some photography, some video and making these maps (see pic) and it seemed that it would be really nice to display it in a way that the communities can come back and see it and feedback and create more of a dialogue. My university have links to Furtherfield gallery. I’m based at Royal Holloway University. It’s nice to do a collaboration and it’s all come together. Lamar: You’ve kind of answered the next question, but what message are you trying to convey through this exhibition, what would you like people to take from this? 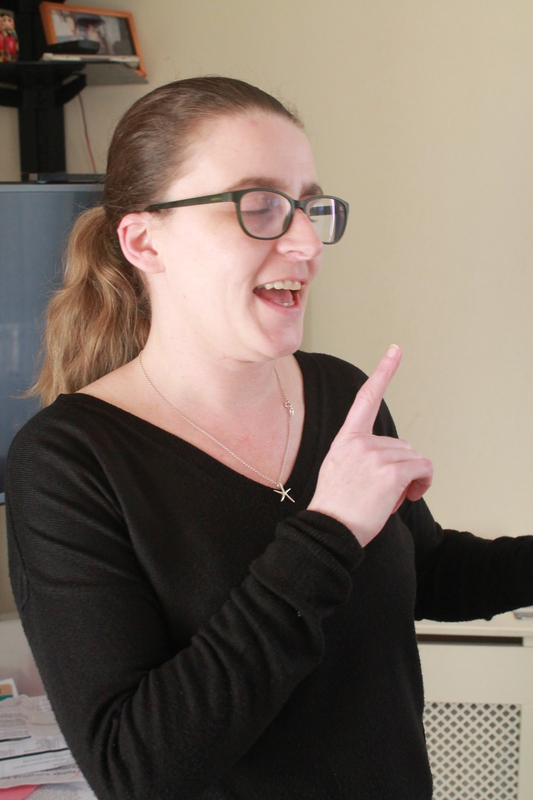 Katherine: I suppose I want people to engage with it and respond in their own way and that’s what I’m really intrigued about as a researcher – always interested in what people make of it. For me, I want to express that Finsbury Park means a lot of different things for different people, and just try to understand what that means really. It’s not just Finsbury Park, I think the whole of London, all cities around the world, are what we might say superdiverse. All different walks of life, not just race or ethnicity but in terms of gender, class, age. I’ve been trying to work with people in all these different groups. So, really my outcome would be for people to engage and start talking. Naomi: You said something about sameness and difference, what do you mean by that? Katherine: Yeah, that’s a good question because I don’t normally use that word sameness. I might say difference because I think everyone has differences – we all have different experiences, and we grow up differently. There are kind of similarities that are shared between people, and the acrylic maps that were created with different groups in Finsbury Park hint at that. Things that everyone might draw on the map are Finsbury Park – everyone knows what the park is – or they have these kinds of places, which everyone has some sort of understanding of. Even if those understandings are different they still have those shared places and I think those shared spaces where people can come together even if they are just passing each other is kind of important. Morgan: Why did you choose Finsbury Park in particular? Katherine: That’s also a really good question. I felt Finsbury Park had people from all walks of life. It’s one of those places you can’t quite pin down. There were also quite a lot of practical reasons, because Furtherfield were based here it seemed like it would be nice to collaborate with them. I grew up in North London, I’ve always loved Finsbury Park – I know it in some ways, in my own way. So I’ve just always loved it as a place so I think it really interested me to explore it more. Morgan: What are your Finsbury Park highlights? Katherine: I think the park for me will always hold a special place in my heart because I’ve always come to the park for many different reasons and it sort of allows lots of different people to hang out – it’s a free space. I really like the reservoirs as well, which are sort of closer to Manor House but in Woodberry Down. They’re a really beautiful space to walk around; I really like that sort of urban nature space I guess as well. There are some really great cafes and restaurants dotted around. Fonthill Road I think is so interesting. I’ve never really found a road like Fonthill Road with all those clothes shops, and just wandering about there. Blackstock Road – I really love Blackstock Road and also Seven Sisters. I just, I guess I love Finsbury Park. We’ve heard that some people think the arts are not for them. So over the next few months we’ll be highlighting and sharing amazing creative experiences that are happening around Finsbury Park that all local people can get involved in.